Frank Kaczmarek was born in Boston Massachusetts in 1940. The son of a fashion designer, Frank began painting and drawing at a early age. He resides with his family in Cambridge, MA. 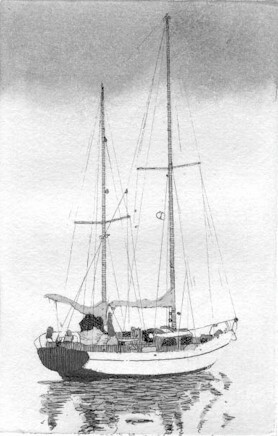 Basically a self-taught artist, Frank has worked with various media including watercolor, etching and silkscreen printing, specializing in sailing and nautical scenes and landscapes. The work is realistic, yet each image relies more on mood rather than a specific place or object for effect. To produce his prints, Frank employs the techniques of etching and watercolor. After the drawing for the print is etched onto the copper plate, it is immersed in an acid bath which bites away at the etched lines. Then etching ink is applied to the surface of the plate, forcing the ink into the etched lines. The inked and polished plate is placed on the bed of and etching press and a damp sheet of 100% rag paper is placed on top of it. The pressure of the rollers embosses the lines of ink into the paper. The process is repeated for each etching. After the edition is printed, Frank then handcolors each print. An important aspect of Frank's work involves the interaction of the watercolor and the moistened paper. He utilizes the absorbent properties of the paper to create a relaxing and calming effect while the hard etched line give a contrasting realism to each print. Frank's etchings are in collections and galleries throughout the United States, Canada, Europe and Japan.